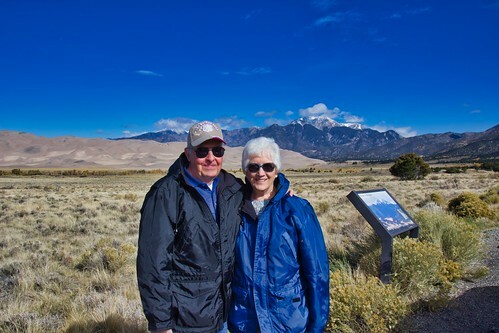 Our final sightseeing stop on our Last Hurrah trip out west in October was a very brief one at Great Sand Dunes National Park, near Alamosa, Colorado, on Monday, October 15. It was brief because we were homing. We'd had enough of motels to last us for awhile. 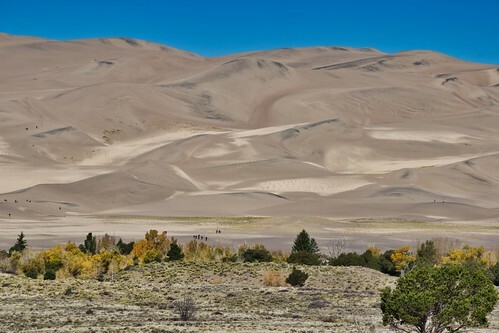 So, really, this visit to Great Sand Dunes involved only a few photos from the road to the Visitor Center and the scenery visible from the area around the Visitor Center. We didn't take time to do any deeper exploring. One doesn't normally expect to find sand dunes so far from large bodies of water or nestled at the base of snow-capped mountain peaks or containing dunes in excess of 700 feet tall, all of which combine to make this a special place indeed. The main dunefield, at its widest point, runs six miles and, at its greatest length, eight miles. 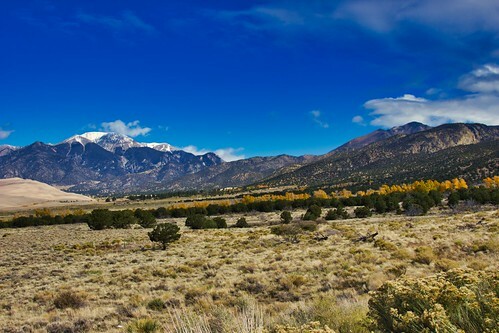 The Sangre de Cristo Mountains provide a stunning backdrop to the dunes. To lend perspective to the size of the dunes, those tiny specks on and at the base of the dunes are people. 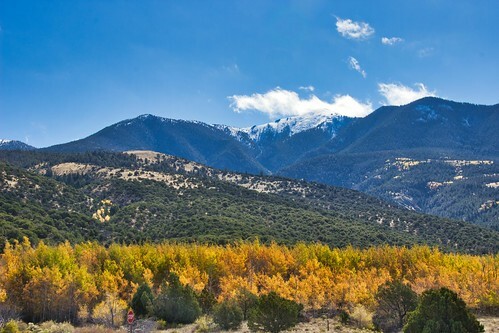 The fall foliage of the aspens was glowing when we were there. And thus concludes the saga of our Last Hurrah trip out west. Thank you all for letting me share the memories with you. And now the announcement. I've decided to retire from blogging. This will be my last post. It's impossible to adequately express my appreciation to all the bloggers who have encouraged and supported me since I started this journey back in 2010. Many of those special people are no longer blogging, and I've lost contact with them. Some, however, have been faithful encouragers almost from the beginning. Others have come along more recently. But all are truly appreciated. Each one has been a blessing, and I'll miss you. As for the blog itself, my plan is to leave it active for now, although I may take it down at the end of the year, to avoid Flickr's annual fee for continuing photo storage. So my friends, thank you and farewell. May God greatly bless you and yours. I'm sorry to hear that you are retiring your blog. I've enjoyed visiting with you over the years, and very much enjoyed meeting you in Yellowstone. 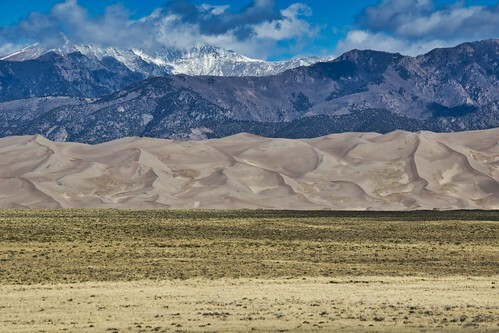 Thank you for this post on the Great Sand Dunes. We've missed that one on our trips. Thank you, George. One of the best things about blogging is that I've met some of the nicest people, and you and Betsy are certainly two of them. I, too, am so glad that we've had the opportunity to meet face to face a couple of times. 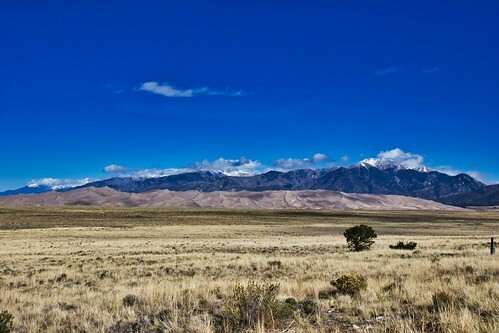 The Great Sand Dunes National Park is beautiful and unique. I hope you'll have the opportunity to check it out in person someday. I loved loved loved reading about your 'last hurrah' trip... I especially loved reading about Canyonlands and my favorite place, Monument Valley. So glad you all took the tour... You got some amazing pictures. It was your Monument Valley tour experience that motivated us to do the tour this time, and we were glad we did. I'm sorry about the health issues you've been having, but you're definitely an inspiration with your persistent attitude of keeping going to the extent that you can. My hip and knees are much better, but it doesn't take much physical activity to set me back again. Your pictures are wonderful. I have enjoyed this trip through your eyes. I am sorry that you will no longer be blogging, but I do understand. Thank you so much, Ruth. You've been a faithful encourager for many years. You've been a good blogging friend almost from the beginning, Steve. Thanks for the email address. It's different than the one I'd been using. Linda, sorry to hear this is your last blog, but I truly understand. We will miss you, but the joy of getting to know you through blogging has been fun and a blessing. Take care and God bless you and Doug. Gerri, I’m glad, too, to have met you through our blogs. I pray that Mike’s surgery will result in full recovery and wish you many more years of seeing America in your Ollie. The sand dunes look very unusual in combination with the mountains. Quite unexpected, aren't they? As for your retiring from blogging, I would just like to highlight how grateful I am that we "met" through the blogging and how much I enjoyed your posts as well as your replies to my comments. Thanks for all the effort. Yes, seeing those huge dunes at the base of the mountains is quite a sight. It's a fun place to visit when there's adequate time to do more exploring. Fortunately, we'd had that time on a previous visit. This time, home was calling. I've appreciated getting to know you through blogging, too, Petra. I look forward to continuing our friendship via email.